When I thought of this 14 Day Program Idea I felt so excited! This is a type of big project for me that I know I won’t just be adding value and sharing to others (to you!) but I will also be reminded of the importance of PRODUCTIVITY. Every day will be like preaching myself but also teaching you which is like again, shooting two birds with one stone. PRODUCTIVITY has been a topic close to my heart since then. I am a huge Planner person. Click here to know What’s Inside my 2014 Planner. I love making lists, to do’s and scheduling things. I remember back in High School I will write in a piece of paper my daily schedule. From wake up time, breakfast, tooth brush, bath time and so on and so forth. Sign Up for 14 Day Productive Living FREEBIES now!!! I love the feeling of having a productive day. Of getting things done and adding just making all my goals and plans align. A change in your emotions. You may feel depressed, stressed and sad over tasks that can’t be done or you don’t know how to do. Once you commit to be a productive person you will learn to control your emotions over things. To prioritize what matters most and to stop reacting wrongfully on things. You will feel happier and lighter at the end of the day for you know that you have done something valuable. A change in your social life. Since you know how to effectively manage your time over the tasks of today, you’ll be much better socially. You will find time for friends and for networking with people that matters. A change in your mental health. You will thing clearer from now on. Your mind won’t be in mess with the things that you need to do, the events you need to attend and so on and so forth. You will regain the control over your busy life in an instant. A change in your financial life. You will realize how productivity can cause you to earn more. Because you are managing your time and your efforts well, you will start to notice that money comes after. You will design your day with the focus of being effective and productive and just getting things done right. You will immediately feel the differenece of productive living can do. A change in your overall life. Far more than just the aspects of your life, once you become productive, the change will be in every inch of you. You will feel confident, you will feel contented, you will feel happy, you will feel better. The possibilities are endless. 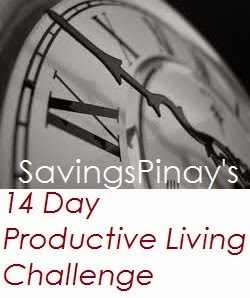 The 14 Day Productive Living Program is for you! It is your chance to reclaim the freedom over your busy life. No more running late, no more cluttered thoughts and ideas and no more wasted moments. After 14 Days, you will live productively. Sign Up for FREEBIES NOW!!! One great thing to add value is to SHARE. If you know anyone whom will most likely needed this program in his/her life, SHARE IT!